The deep red-orange, slightly nutty-tasting cooking oil is known as annatto oil in the Caribbean. This oil gives a unique warming quality to Latin American. Use it to marinate chicken or pork for a scrumptious meal or use it to infuse rice dishes with colour and flavour. 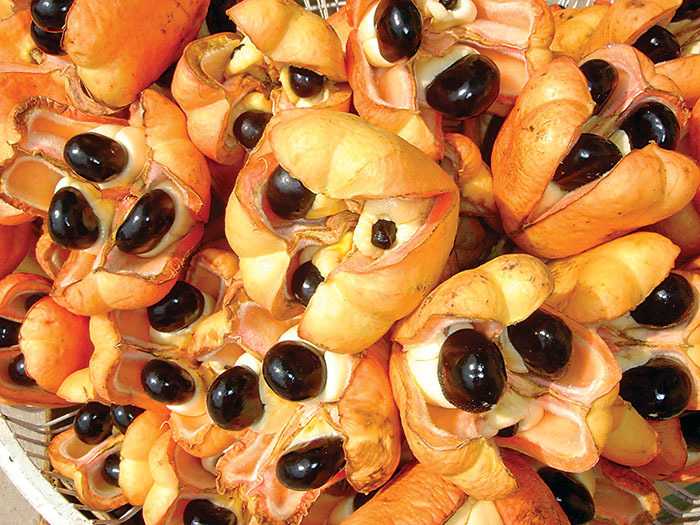 Ackee, grown in a handful of islands, is hugely popular in Jamaica. Paired with saltfish (cod fish) it's Jamaica's national dish. The ackee fruit is bright red. When ripe, it opens to reveal three large black seeds and bright yellow flesh. Ackee's scientific name, blighia sapida, comes from Captain Bligh, who introduced the plant to Jamaica from West Africa. Canned ackee is sold in West Indian markets. It is the seed or extract from the achiote tree and is used heavily in Central and South America as a dye, medicine and food ingredient. 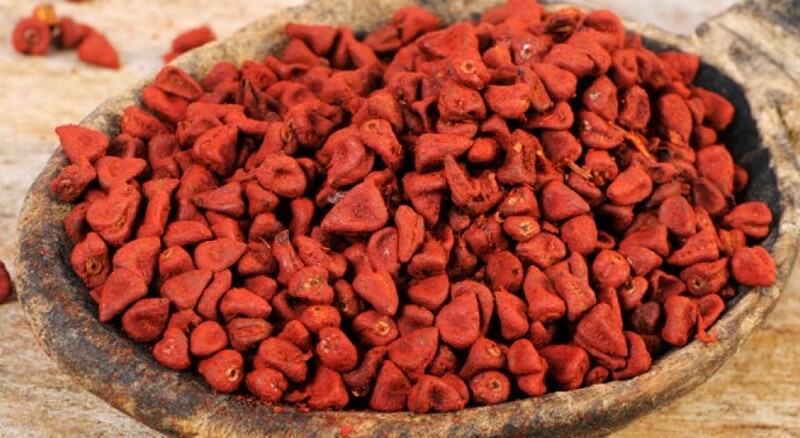 Annatto is used to boost the colour of products like margarine and cheese. It was also used regularly as a condiment to add flavour to some Jamaican dishes. 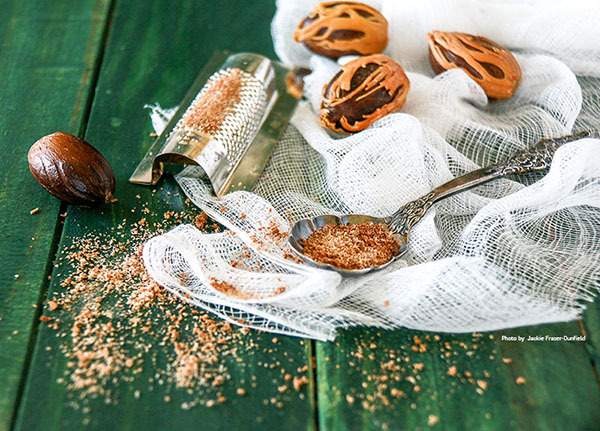 Annatto has a nutty, sweet, peppery flavour and the aroma is slightly peppery with a hint of nutmeg. Although annatto seems to be fading into the great sunset of Jamaican cuisine, the seeds, powder and oil can still be found in some spice aisles as well as in Latin American stores. Bammy is made from the bitter cassava and is usually fried golden brown and served with fish or ackee and saltfish. To fry, soak bammy in cold water or milk for about five minutes. Or, instead of frying, bake the bammy, drizzle a bit of honey on top and enjoy. 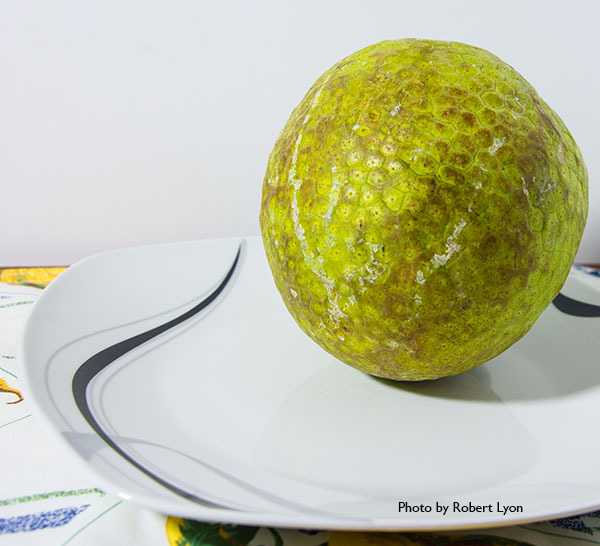 Breadfruit is native to the Pacific islands and was brought to the Caribbean to feed enslaved African people. Bulla is a sweet, cakey dough baked to a golden or dark brown crustiness. 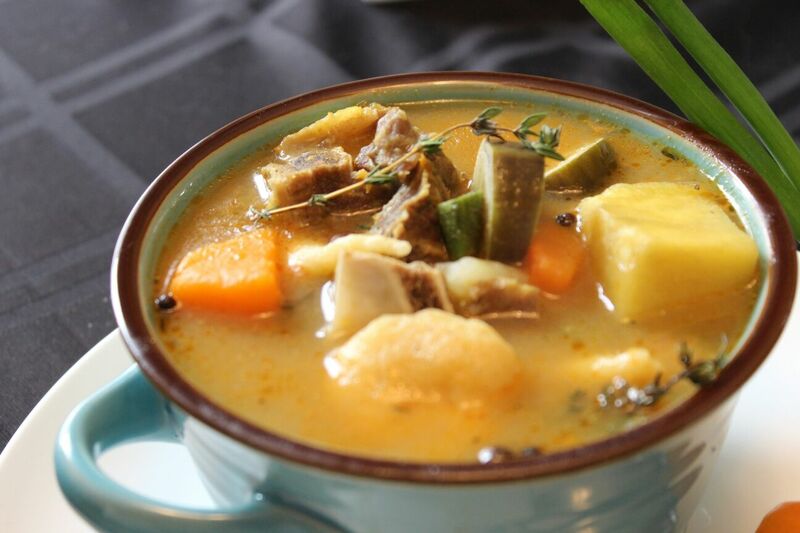 A long-time favourite of Jamaicans, bulla was born out of poverty. 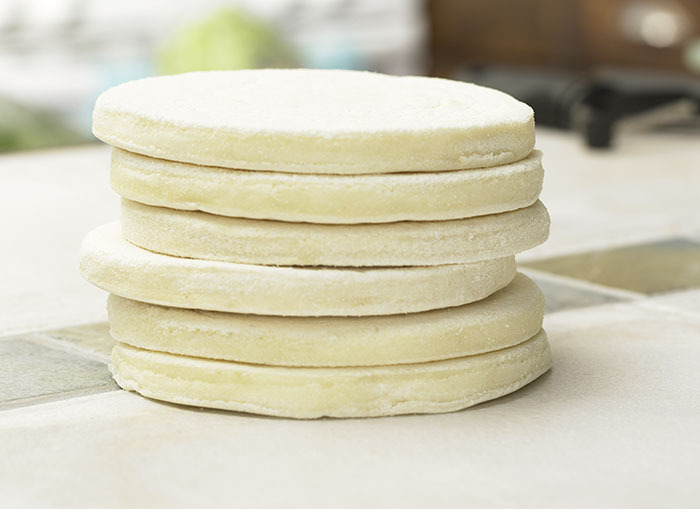 The traditionally round cake holds sweet memories for many Jamaicans. 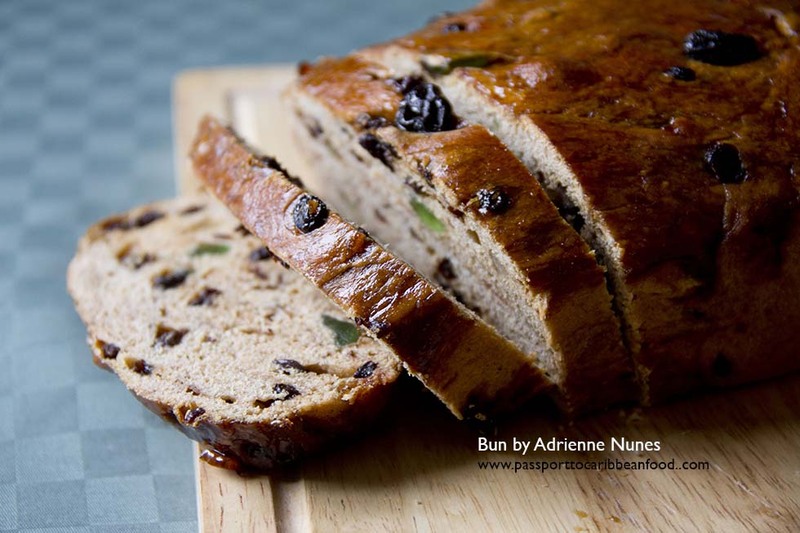 Jamaican spiced bun, also popular in other Caribbean islands, is shaped like a loaf of bread. Bun is dark brown colour and is commonly eaten with cheese during the Easter season. There are also round-shaped buns that eaten any time throughout the year. Some folks like to dress up their bun with butter, avocado and other toppings. Buns can also be grilled with cheese for another taste sensation. Spelled half a dozen different ways, this colourful word turns up in Jamaican records as early as 1696. This leafy, spinach-like vegetable is typically prepared as one would prepare turnip or collard greens. 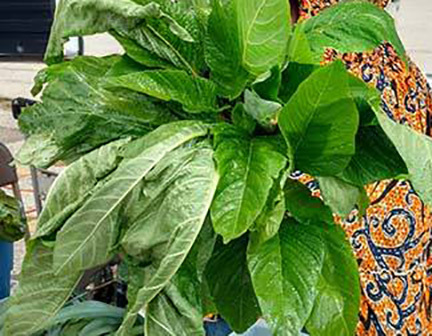 NOTE: Callaloo in the eastern Caribbean refers to the leaves of the taro, known as dasheen in the islands, plant. Low in calories taro is one of the world’s most nutritious foods and is often described as a “miracle food.” Typical of leaf vegetables, taro leaves are rich in vitamins and minerals. They are a good source of Thiamin, riboflavin, iron, phosphorus, and zinc, and a very good source of vitamin B6, vitamin C, niacin, potassium, copper and manganese. 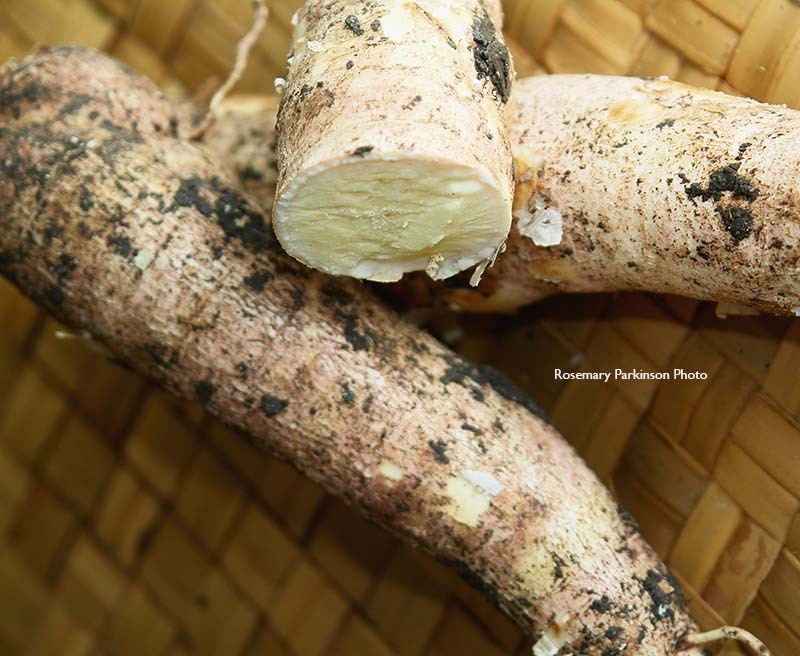 Believed to be one of the staple foods of the native Arawak Indians, is a versatile root crop. It's also known as yuca, tapioca and manioc. It originated in Brazil and Paraguay. Thailand is the main exporter of cassava with most of it going to Europe. Portuguese traders carried it to Africa. There is a sweet and a bitter variety. 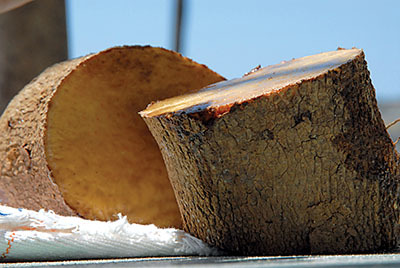 Cassava can be used to make bammy (a type of flat, round, bread), puddings, cakes, flour and other products. NOTE: The root of the bitter cassava can be poisonous. To remove the poisonous acid, the cassava is grated and squeezed through a muslin cloth to get rid of as much of the acid as possible. Or, the cassava is boiled -- 45 minutes to an hour -- and the water discarded. This vegetable resembles a large pear and is usually light green. 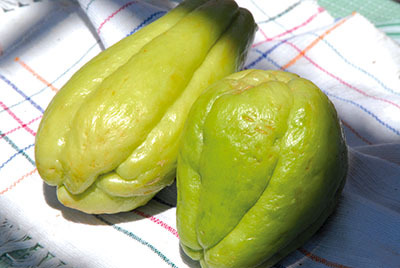 A member of the squash family, it's a must in beef soup, and is popular as a garnish for escoveitch fish. It can be boiled and eaten hot with butter or grated cheese. 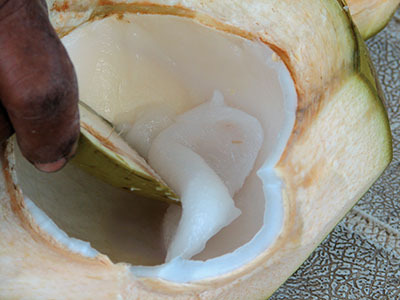 Both the water and the "jelly" (pictured) of the green coconut find their way into Caribbean drinks. 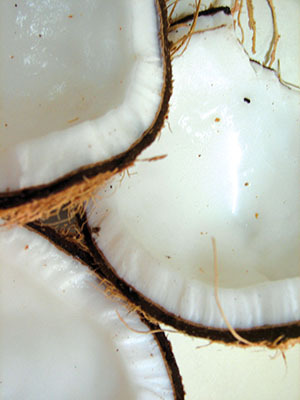 The jelly of the green coconut is usually eagerly scraped out for eating. This starchy tuber that is usually served boiled or cut up and used as a thickener in hearty soups. Coco is a slightly smaller relative of dasheen. In the eastern Caribbean the leaves are called callaloo. ‘Escabeche,’ is a major contribution from the Spaniards to Latin America and the Caribbean. The vinegary concoction is of Jewish origin and is used as a means of preservation. It has evolved into the Jamaican classic known as escoveitch fish. 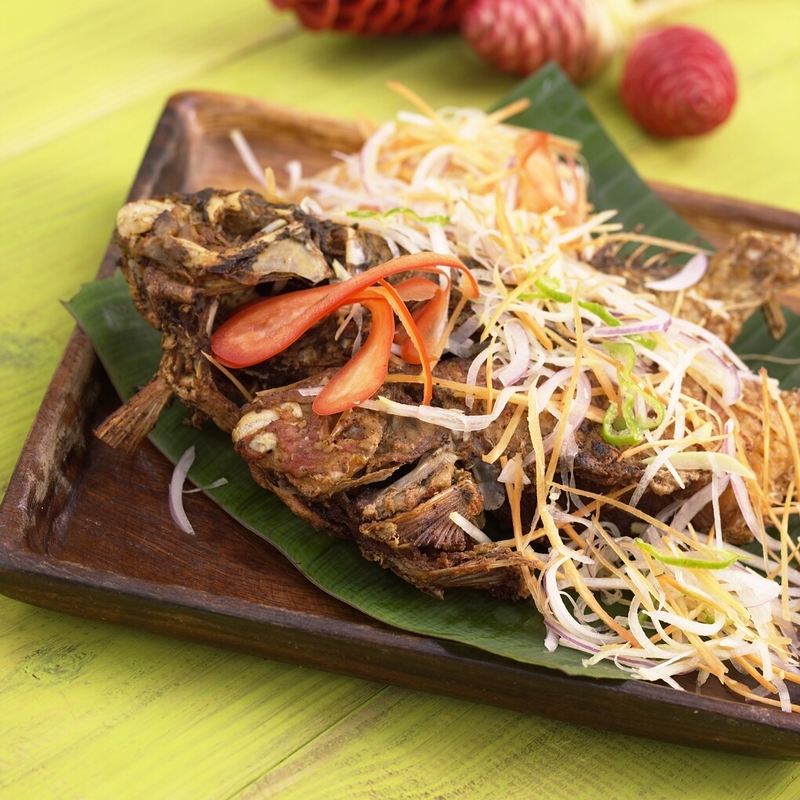 The whole fish is gutted, lightly fried and marinated in a mixture of vegetables and peppers cooked in vinegar. Ceviche is popular in many other islands and is the national dish of Peru. 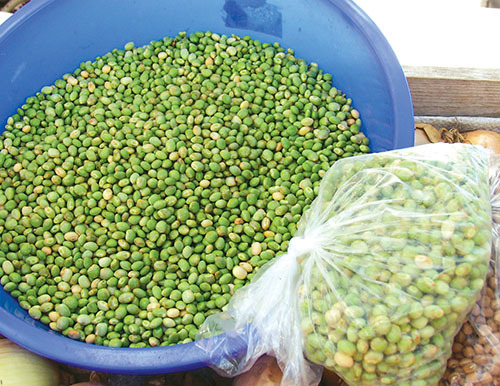 The green peas are used in soups, stews and to make rice and peas. Jackfruit is Native to South and Southeast Asia, it is believed to have originated in present-day Goa, India. 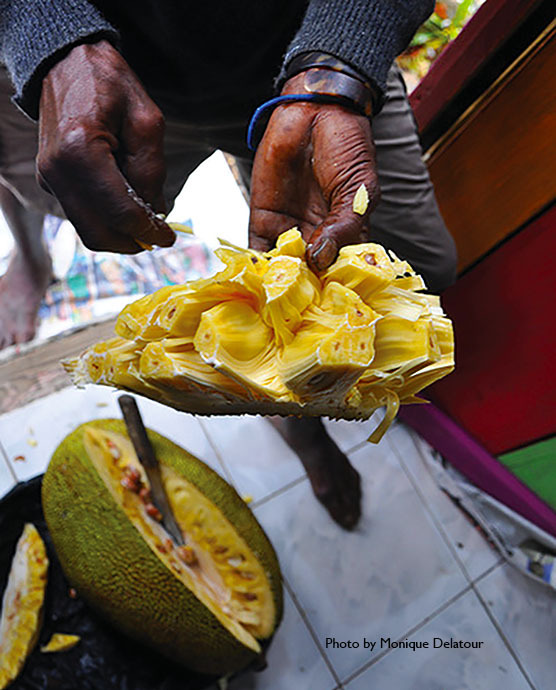 Caribbean people eat the yellow flesh of the ripe jackfruit whereas Asian people often use the green jackfruit in their cooking. Konparet, which tastes like a ginger biscotti, is one of Haiti’s most loved confections. 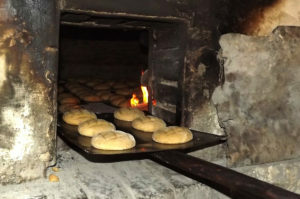 It was introduced to the Jeremie area by a Haitian woman Josephine Charmant who was smitten by the ginger bun most likely a bulla that she discovered on a trip to Kingston, Jamaica in 1914. Discerning Caribbean cooks skip the pre-ground nutmeg sold in supermarkets, opting instead for the spice whole, grating it only as needed. The inner kernel of the fruit is more flavourful when freshly grated. The spicy sweet flavour of this aromatic spice makes it an excellent addition to cakes, puddings and drinks. 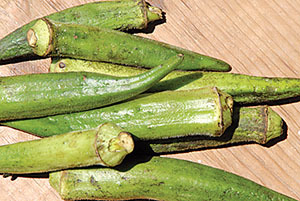 This finger-shaped vegetable, green-ridged and three to five inches long, is fried as a side dish, used as a thickening agent in (Jamaican) callaloo or mixed with cornmeal to make coo-coo. It's also the essential ingredient of Louisiana gumbo. It has its origin in Abyssinia (Ethiopian). A unique hybrid of an orange and a tangerine, this Jamaican gem is sweet, delicious and incredibly juicy. Ortanique is reported to be an old chance seedling that came to the attention of C. P. Jackson of Mandeville (south central Jamaica) in 1920. Ortanique caught on early in Jamaica, but was not planted much until later in the 20th century when small shipments to Canada and Great Britain got loud applause from appreciative consumers and fetched high prices. 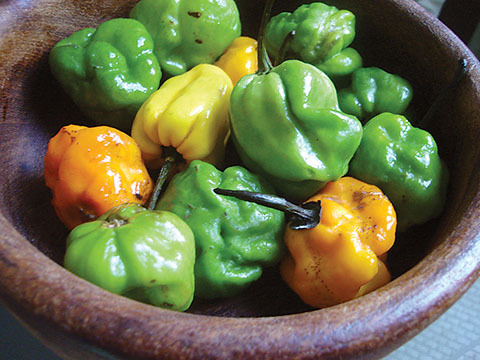 Jamaican ortaniques are pale, juicy, seedless and are widely considered the best versions. 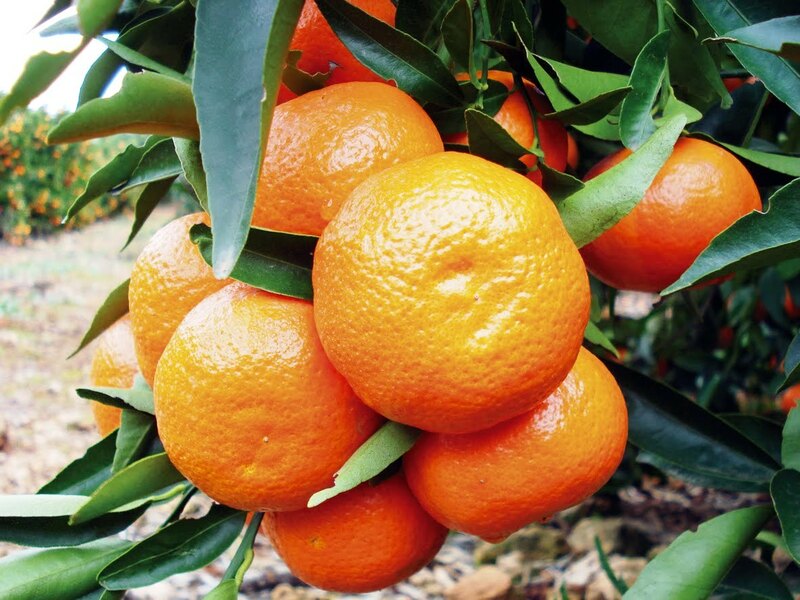 Ortaniques grown in places like the Mediterranean have thicker rinds, seeds and a bright orange colour. 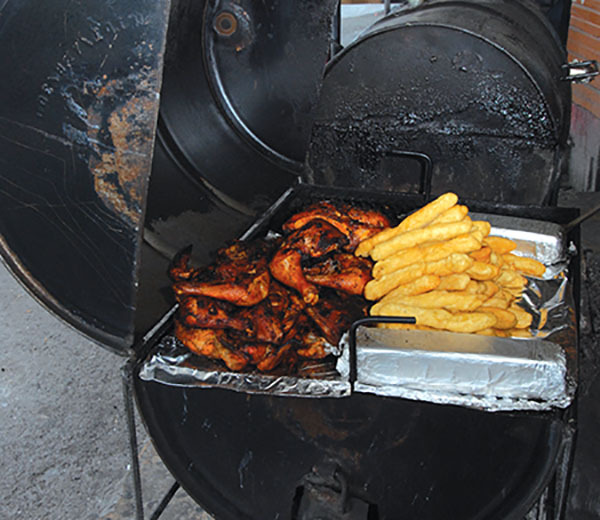 Drum pans sliced in half length wise have become popular for roasting and selling spicy chicken on roadsides across Jamaica. Pan chicken vendors sometimes sell jerk pork and festival (fried dumplings with a bit of sugar thrown in). A dark-brown berry, it combines the flavours of cinnamon, clove and nutmeg. All but a tiny bit of pimento is grown in Jamaica, the remainder being grown in southern Cuba. Pimento is used in dishes like escoveitch fish. Saltfish most often means cod. 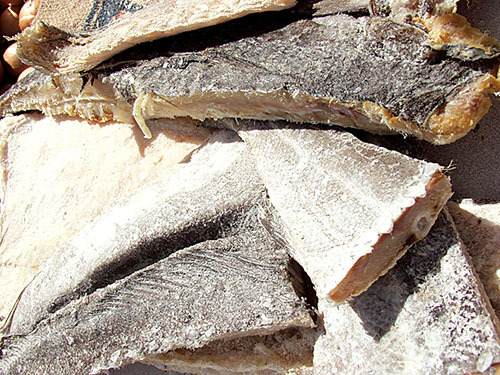 Before the era of refrigeration, salting was a method to preserve fish. Saltfish is sold around the world in Italian, Spanish or Portuguese markets under some variant on the name bacalao. The fiery Scotch bonnet (shaped like the bonnet of a Scotsman) ranges in colours from yellow to orange to red. It's not the hottest pepper in the world, but it ranks close to the top as a scorcher. To save yourself some pain, stay away from the seeds and vein. Remove the pepper from soups and other dishes before it bursts open. Long, thin flour dumplings, these are immensely popular and are often added to soups and stew peas. Stinking Toe or 'Tinkin Toe is also called Locust. Scientific name: Hymenaea Courbaril. Peak season is April through June. Stinking Toe can be found throughout the Caribbean as well as Mexico, Central and South. 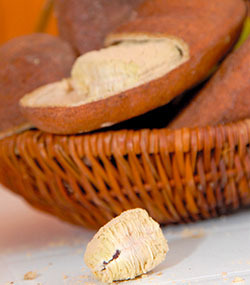 The smooth powdery pod is encased in a thick brown shell. Developed by Jamaican agronomists, this fruit is a cross between an orange and a grapefruit. It got its name from the appearance of its rough, wrinkly, greenish-yellow skin, wrapped loosely around the orange pulpy citrus inside. 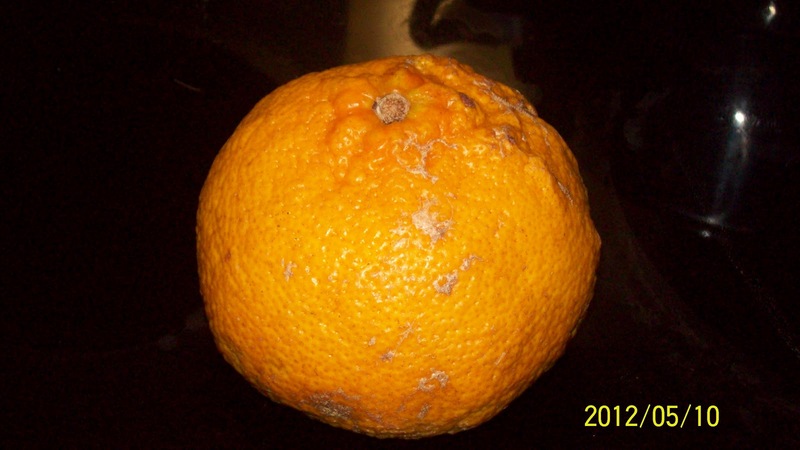 This grapefruit-mandarin cross looks a bit like a grapefruit in an ill-fitting suit. It's sweet and juicy, though, and simple to eat since the peel comes off easily and the fruit pulls apart into tidy segments that that are virtually seedless. Yam is not to be confused with the sweet potato. In the Caribbean yams are served boiled, mashed, baked or grilled. 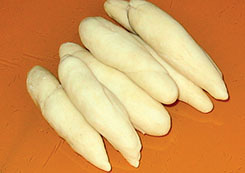 Thereare many types of yam and they vary in size, shape and colour - white to purple.